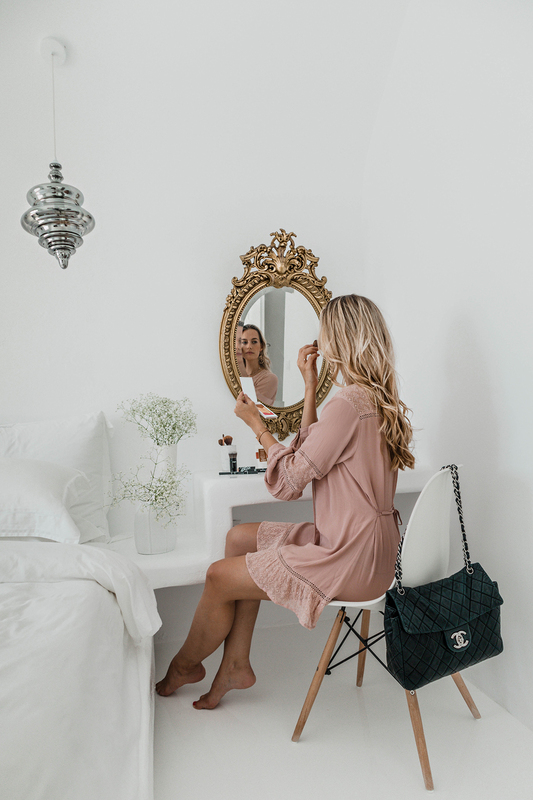 The past few months I have practically lived out of my suitcase and when it comes to my beauty regime on-the-go, I have finally created a routine that works for me. Instead of packing my entire makeup drawer when traveling, I now pair my collection down to fit in a TSA-approved travel case. So I try to keep what I pack as simple as possible and stick to my favorites by only bringing my essentials. The very last thing I want on a trip, is an overflow of products. So I love bringing two-in-one products that have multiple use and make my makeup routine a lot easier and more efficient! 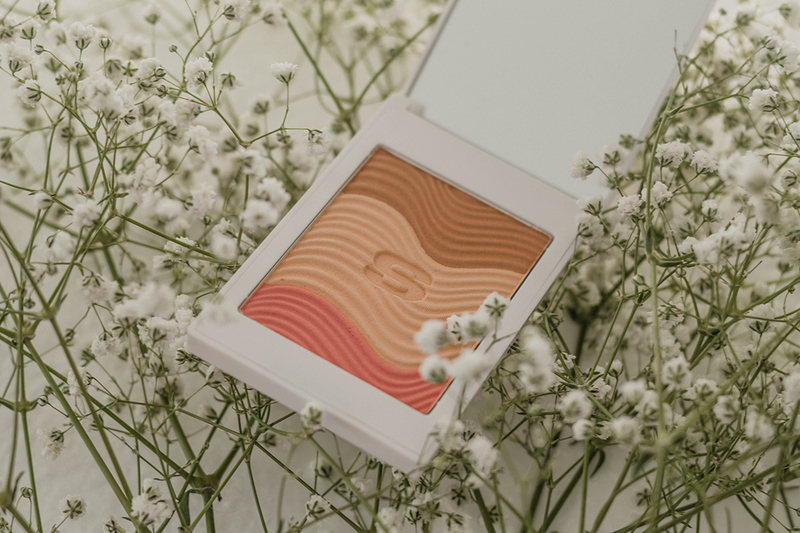 You may have caught on that I’m obsessed with the Sisley cosmetics line. All of their products are packed with super quality skin ingredients. I always start my makeup routine with a moisturizer with SPF. I use sunscreen 365 days a year, with no exceptions. 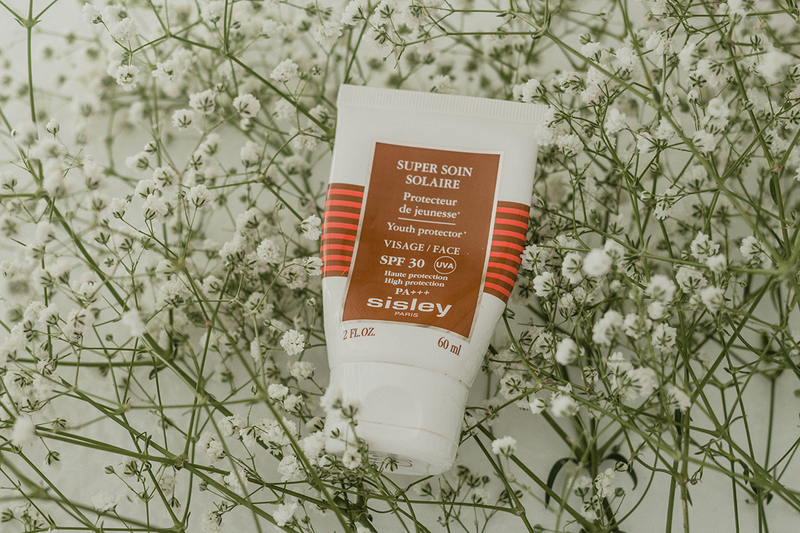 The SUPER SOIN SOLAIRE VISAGE is the perfect size to travel with, it has a SPF 30, it absorbs easily and it doesn’t leave my face feeling greasy. 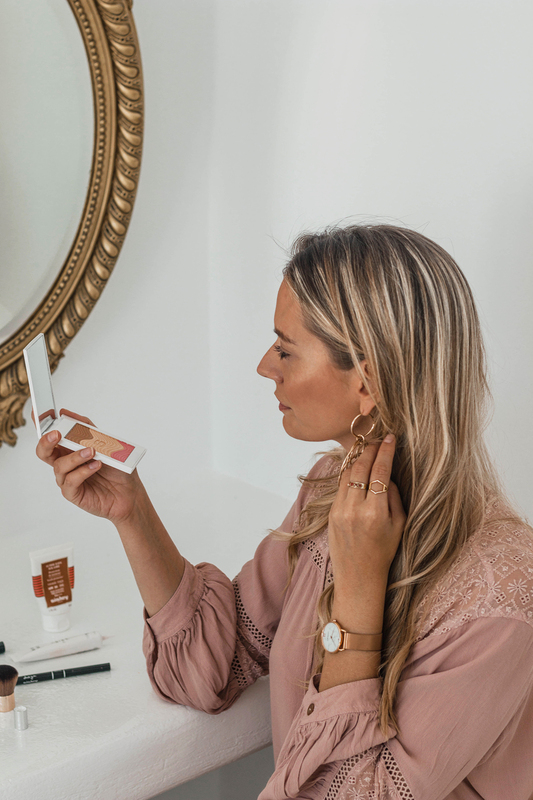 The Sisley INSTANT ECLAT glow makeup primer is my go-to product when it comes to adding that instant glow to my complexion and also helps to brighten up my skin. This is officially the best primer I have ever tried. I apply the creamy and almost velvet-like consistency all over my face before using foundation. And talking about makeup multiples: I also use this primer as a highlighter on the contours of my face after finishing my makeup, since it has a beautiful, subtle shimmer. After I’m done with my primer, I’ll move over to the SISLEŸA LE TEINT foundation. This one goes on super soft, has great buildable color, neutralizes the redness in my skin and blends extremely well. 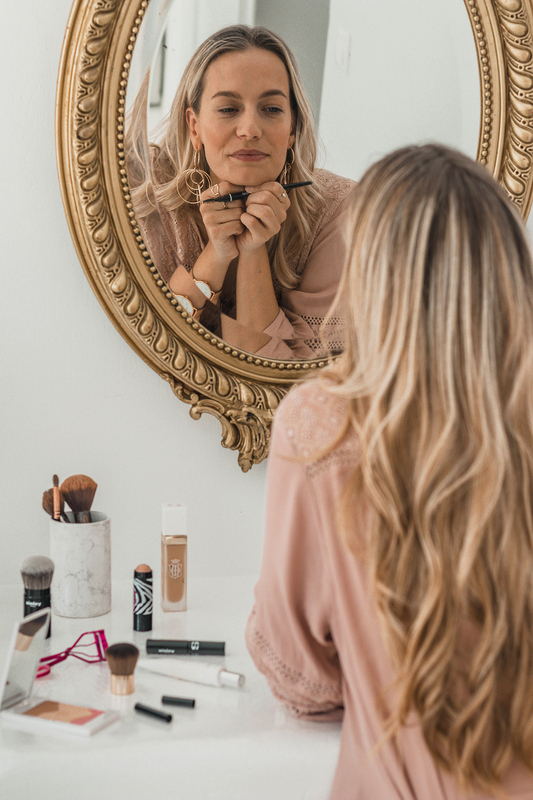 But most important for me, is that is = IT stays on throughout my day and is the kind of foundation that makes me feel like I have nothing on my face! And a big PLUS is that it’s a complete anti-aging solution and skin-perfecting foundation, in one. 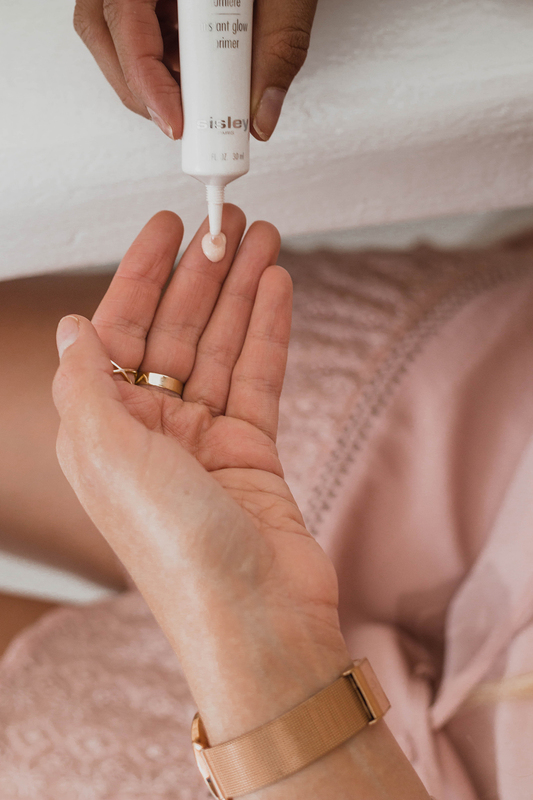 The Sisleÿa Le Teint is infused with a powerful, youth-boosting botanical complex that fights all three types of aging: genetic, environmental and behavioral. One of my most travel-friendly makeup products is the three-in-one bronzing palette: PHYTO-TOUCHE POUDRE ECLAT SOLEIL. I use this to add warmth to my face. The three colors are designed to work well together and create the perfect sun kissed look all year round. Sweeping the middle powder shade as a setting powder all over the face, the darker shade along the cheekbones and the lovely pink shade for a healthy color on the apples of the cheeks. The powders are enriched with Shea and Camellia oils and it gives a smooth, even result with no powdery effect. 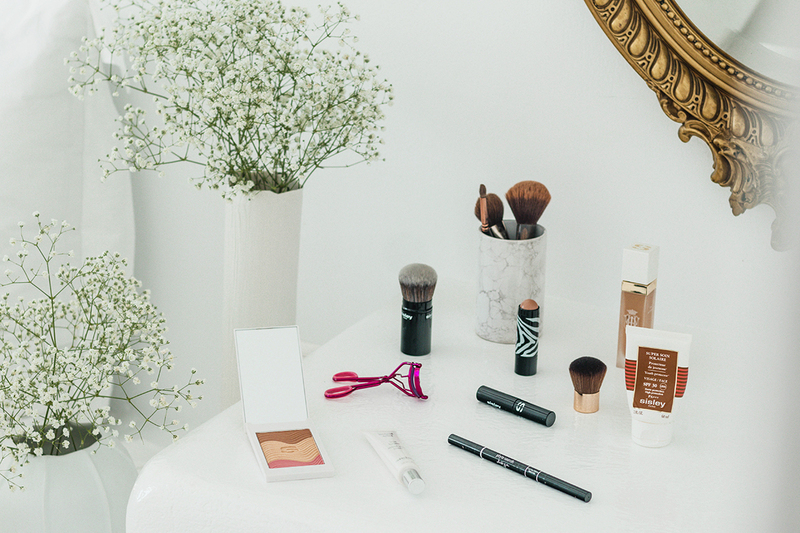 It comes with a good size mirror and a cute little Kabuki Brush, which is super for travel! For a more glowy finish, I recently discovered this PHYTO-BLUSH TWIST and I love it! The cream-to-powder formula is long lasting, easy to use and the color goes on naturally with a glowy finish. I put a few dots of it on the apples of my cheeks and blend it. It is extremely handy that I can use it on my lips as well. I love to keep them on the neutral side, by only dabbing on a little bit of the product with my finger. Even on low makeup days, I won’t forget to work on my brows. I have been using the PHYTO-SOURCILS DESIGN triangular-tipped brow pencil and I don’t know what I’d do without this 3 in 1 product. This one fills in my brows with a gliding texture that I really like. On top of that, I use the PHYTO-SOURCILS FIX to help to keep my brows in place all day. It is a thickening and setting gel for eyebrows. This formula is enriched with nurturing key skin care ingredients and nylon fibers that adds body to eyebrows. It applies very precise and easy to make your brows look full within seconds. For the final step I use the SO CURL mascara. It has a thick, soft and curved brush. The wand doesn’t pull out too much product, so I always do a couple of swipes through my lashes to build up the effect. It also contains a vitamin-rich Peptide, which is meant to give you more length and thickness, making your lashes look and feel stronger and healthier. What I love most is that it doesn’t leave that crumbly residue that loads of mascaras do. 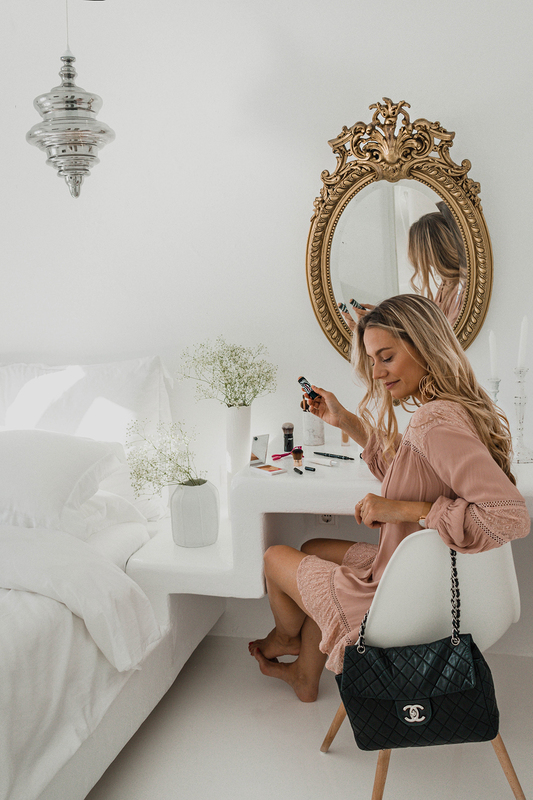 So here where my beauty essentials to create a neutral fresh face while on the go, that’s quick, easy and doesn’t take to much space in your suitcase. To find out more about the products, see the links below! Posted in Beauty, TravelTagged PHYTO-BLUSH TWIST, PHYTO-SOURCILS DESIGN, PHYTO-SOURCILS FIX, PHYTO-TOUCHE POUDRE ECLAT SOLEIL, Sisley, Sisley INSTANT ECLAT, SISLEŸA LE TEINT, SO CURL, SUPER SOIN SOLAIRE VISAGEBookmark the permalink. Your photos are so beautiful! Dying to try that blush twist, seems like it gives a good touch! These sound like awesome products. And also I’m obsessing over your vanity! The vintage mirror is so cute! Sisley is one of the best cosmetic brand, good choices! I love the Sisley range! Looking fab as always babe! The brows are really important, even on days when you’d use a natural look. I’ve honestly never heard of this brand but it’s working for you quite well. Lovely post and great pictures. I only hear great things about Sisley. I need to get onto that primer though. It looks and sounds like a dream. I don’t know much about makeup but these look like great stuff. They look great. Love this post! Your photos are lovely. Your skin glows and these products all sound really amazing! I use Sisley Paris’ moisturizer. I picked it up in Paris during fashion week and it’s my favourite. Been using it since end of September. This product list is perfect! I used to pack EVERYTHING when traveling, and now I’ve gotten so much better at just bringing the essentials. I want to check out their brow pencil! I’ve never tried any of these product before. The look very natural and effortless on you. I’ve got to try Sisley! I’ve never heard about this brand before. 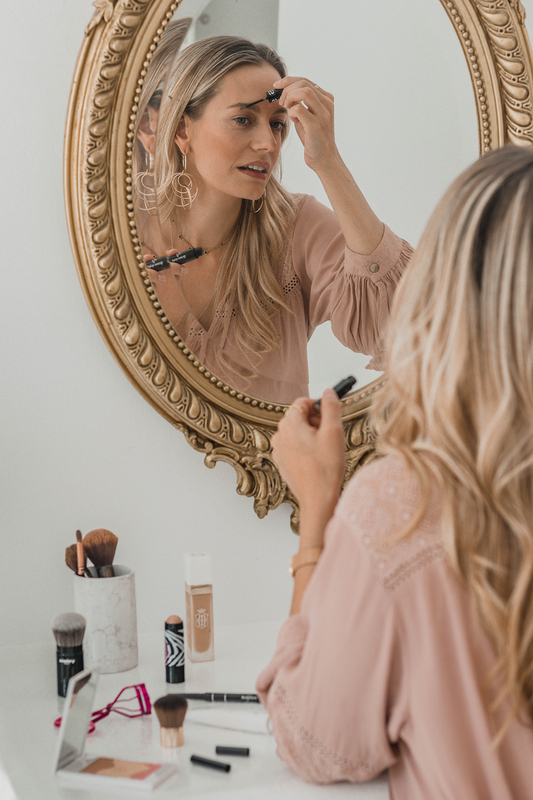 Thanks for sharing your effortless travel make-up routine! These products are great. Its challenging to continue with a skincare routine when traveling, but it is important. Thank you dharing. You have beautiful skin. I agree, travel size skin care products are the way to go when travelling. Love the photos, the gold mirror looks striking against the white washed wall and furniture. I love the minimalistic approach to make-up. You use such great products. You look radiant and I have heard great things about Sisley products! omg yes!!! Sisley is so darn good! I’ve always wanted to try their products! I need to start! You always look so incredibly chic and I absolutely love your beautiful photographs here! I haven’t actually tried Sisley before however I think their range looks very impressive indeed, certainly one to try out. Thanks so much for sharing your travel routine with us! Thanks for sharing! I roughly carry the same number of items around with me (to work and when travelling). Happy new year! Just awesome. Love your photos by the way! 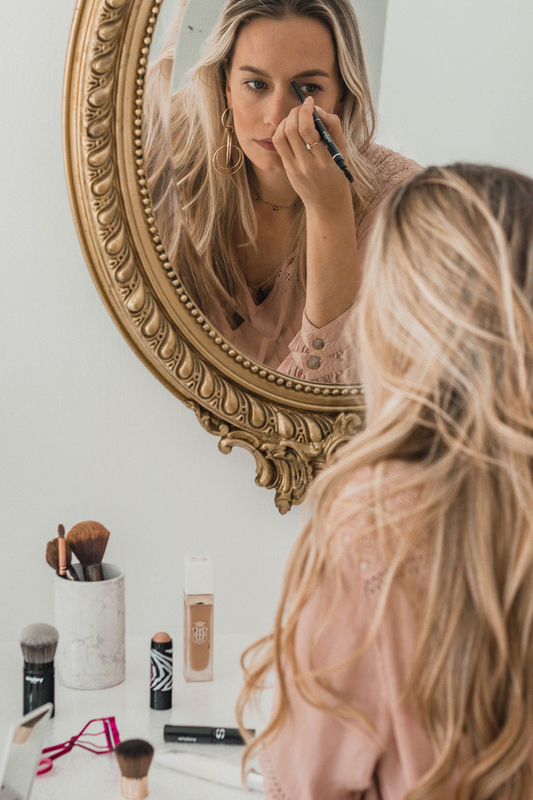 This looks like such a great makeup routine, and I’m loving these beautiful photos! That mirror is amazing! Super cute you look. Thanks for the share. 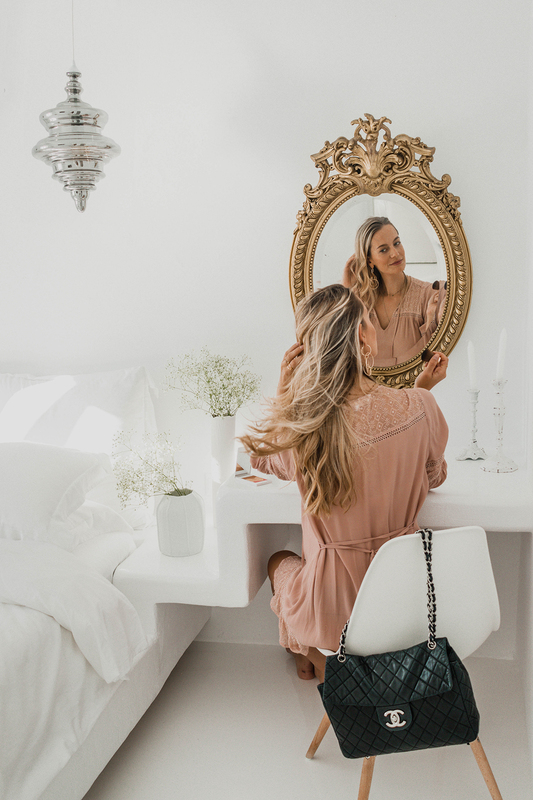 Such a beautiful space to get ready, love the mirror! Looks like you have your travel makeup routine nailed! You look beautiful. A great set for traveling. When I’m on the road and on vacation I use only pastel colors. I want to try PHYTO-TOUCHE POUDRE ECLAT SOLEIL. I like these shades. Your skin is sooo dewy and glowing and I adore this whole shoot so much! I love your interior space and the space you created for your skin products is so light and refreshing. I am obsessed with skincare as well and need to try some Sisley products! I really need to try more Sisley products!